Religious organizations put a lot of work into helping their fellow man. Any drug court out there would be insane to ignore the resources provided by groups such as Catholic Charities or The Salvation Army. Even groups which are not specifically attached to a religion use faith as a tool (AA/NA). However, in the modern world, with its veto of one, it's difficult for a drug court to use any of these programs unless it wants to risk being sued out of existence. The latest collateral fuss in this area has come out of the 9th Federal Circuit Court: Hazle v. Crofoot. A probationer was ordered into a drug treatment program which had religious elements and had his probation violated when he refused to participate. The trial judge determined factual culpability before there was even a trial and a jury was brought in to determine damages. The jury awarded no damages and Hazle did not object while the jury was still there for the judge to send back to put in some sort of nominal damages. The appellate court saves the case for Hazle by working around that tactical choice and sends the case back because when liability is determined the jury has to award some damages. Then the State of California agreed to pay Hazle $1,925,000. The settlement by California appears to make little or no sense unless there is some floor beneath which an award cannot go (no indication of this that I saw) or the settlement was less than another trial would cost (using the first jury as a barometer, the likely outcome seeming to be a nominal award). The general reaction to all of this is to make sure that both religious and secular programs are options. Of course, this leads to at least two problems. The first is that in areas with smaller populations and low economic viability secular options are not likely to be available and drug court programs cannot carve out an individualized program for one or two individuals. Second, if pre-existing programs are supported by a religious group or have a religious component then requiring the creation of competing secular programs is "making a law respecting an establishment of religion." It is the government using its powers economic, legislative, and/or judicial to pull people away from a religious organization to a government created or sanctioned competitor. Even a choice to walk away from outside programs involving religion and only use government employed counselors in government run programs would be "making a law respecting an establishment of religion" in that it punishes an external program because it is religious. In theory, unless the drug court started out with both religious and secular options when it began it will be caught between an individual's free exercise guarantee and the prohibition against inhibiting a religion. The reality is that drug courts will muddle through using whatever programs are available. If that means in order to be viable the drug court has to use the six religion-attached treatment programs (no secular ones being available) then the drug court will do so or it will shut down. After all, sending someone to jail - without offering any treatment program - is always going to be constitutional. If Hazle's probation officer had simply sent him to the probation board and thence to jail there would have been no problem. It was the attempt to help Hazle by sending him somewhere to get help that started the trouble. Over the last week or so, at least three people have pointed out the news story in which an officer asks why all "frisbee" golfers smoke pot and tries to use the driver's admission that he plays as a way to get the driver to let him search the car. Why have they pointed this out to me? 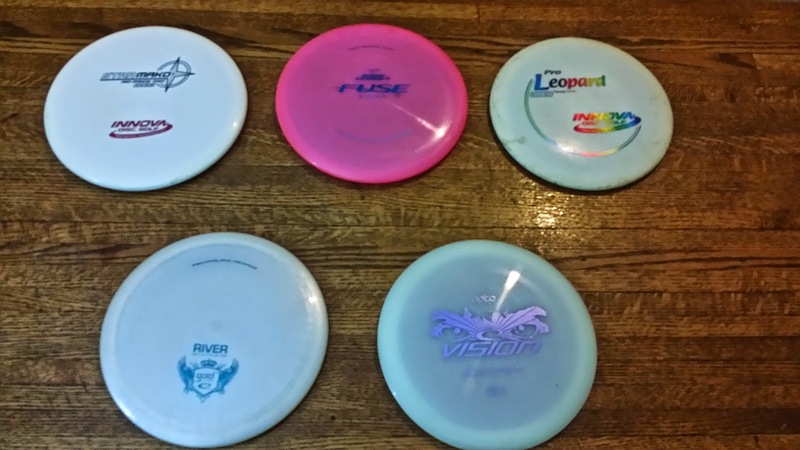 Because I play disc golf (Frisbee is a registered trademark of Wham-O which does not make discs for disc golf). I've been playing two or three rounds a week for about a year now and I've progressed to the point that I can't really call myself a beginner anymore, but not to the point that I'm truly competent at the sport. Nevertheless, I've picked up most of the lingo and can talk a mean theoretical game. Anyway, the idea that marijuana and disc golf are linked is not a new one. Here's a link to a Yahoo! Answers page discussing it five years ago. I've also listened to an interview with the president of the Professional Disc Golf Association in which he acknowledged this as part of the history of the sport before going on to talk about how the sport has evolved into the family friendly game it is today. Personally, I've seen a good deal of variety on this. I've run into everyone from yuppies to hippies to guys with enough tattoos to look like their best job opportunity is as a bouncer to entire middle class families playing disc golf. Of the four courses I play most often three are too open or too busy for anyone to smoke in peace. The fourth is difficult enough that I've only found people serious about the sport on it. So, in the regular course of play I don't run into this. However, I do travel out to other disc golf courses every so often when I get bored of the local courses and want to change things up a bit. One of these is outside a city in the mountains of North Carolina. Whenever I go there I make real sure that I am wearing a shirt and hat that identifies me as working with law enforcement. Because the second time I went down there a guy glommed onto me halfway through the course who was flying high and bragging about how he always played disc golf high (except for the one time his "old lady" came with him). I couldn't get away from the guy because the course has some serious hills and I am a short round guy who by that time was too worn out to move with any kind of speed. Now, I quite like that course, but for obvious reasons a prosecutor from Virginia can't be hanging around in North Carolina with a guy who is bragging about being toasted. Consequently, every time I start to head that way I dig through my old t-shirts and pull out one that says something like "10th Annual Southern Cooperative Law Enforcement Training Conference" with the unmistakable law enforcement eagle across the back. Then I grab my "W&L Law" hat. You can't get much more obvious than that unless you wear a uniform and a badge. Now, you say, that's got to be a bit of an overreaction. Except, at least two other times I've gone down there people have quickly put something they were smoking away. So, I guess what I'm saying is that the officer's belief is far from groundless. Based on my experience, I don't think the majority of disc golfers are potheads anymore, but they're out there. On the other hand, most real players carry a bag that costs between $50 and $200. In that bag they carry anywhere from 20 to 40 discs which cost about $15 each. Personally, I can't see spending that kind of money and then wasting my time being toasted while I play.